5-a-side football is an adapted form of soccer for athletes with a visual impairment. 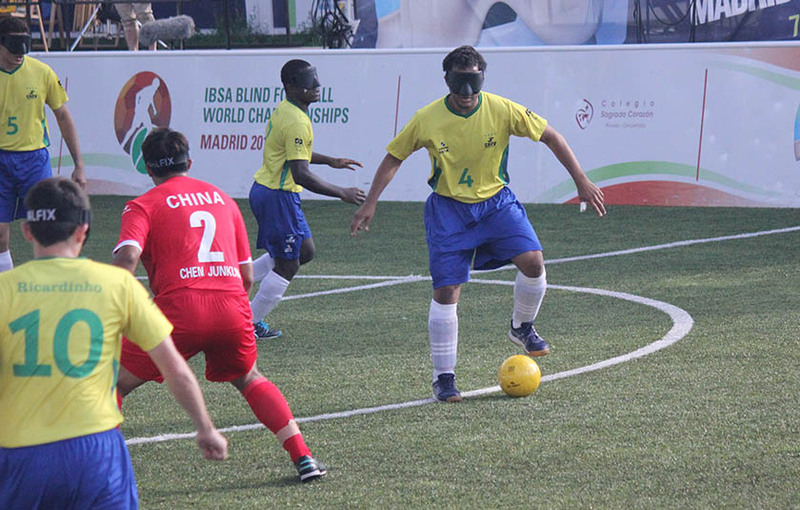 Governed by the International Blind Sport Association since the mid-1990s, 5-a-side football has been part of the Paralympic Games program since Athens in 2004. Competition at the Paralympic Games, however, is currently open only to men’s teams. The five players per team consist of four outfielders and one goalkeeper. Outfield players must be classified as completely blind (B1 category), which means they have very low visual acuity and/or no light perception, while the goalkeeper can be sighted or partially sighted (B2 or B3 category). Fair competition is ensured by all outfield players wearing eye shades. At the Paralympics, eight teams participate in a tournament-style competition. The Brazilians are the powerhouse nation, winning every gold medal since the introduction of 5-a-side football to the Paralympics in 2004. The sport is little played in Australia and no Australian team has ever qualified for the Paralympic Games. Photo of China vs Brazil taken 15 June 2018 by Laura Hale and edited for this site. Used under Creative Commons Attribution-Share Alike 4.0 International licence.